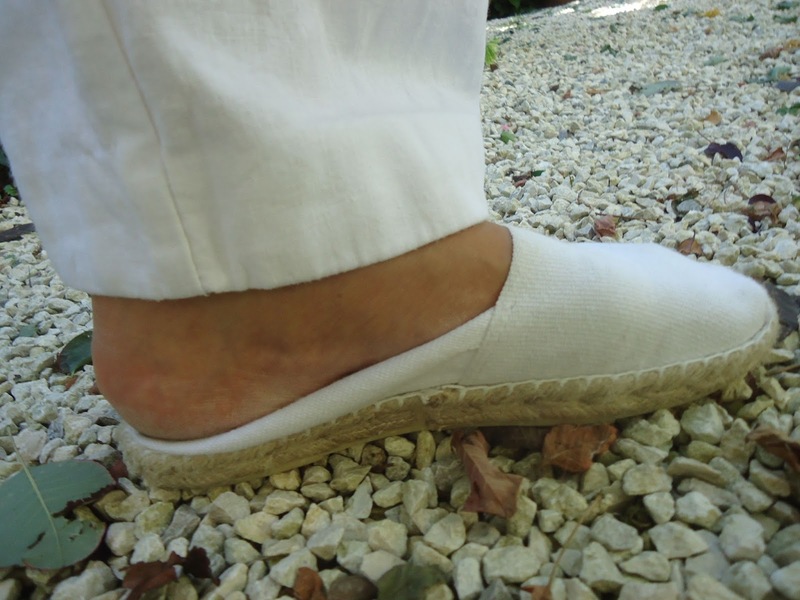 White espadrilles with white linen trousers. Photo by JoyD, July, 2013. La Classique or traditional espadrilles are worn by both men and women and although presently they may not be so popular, they are chic. Over the years, varying heights of wedge heels have been adapted for women but the debatable question would be, is it still an espadrille? My position would be no. 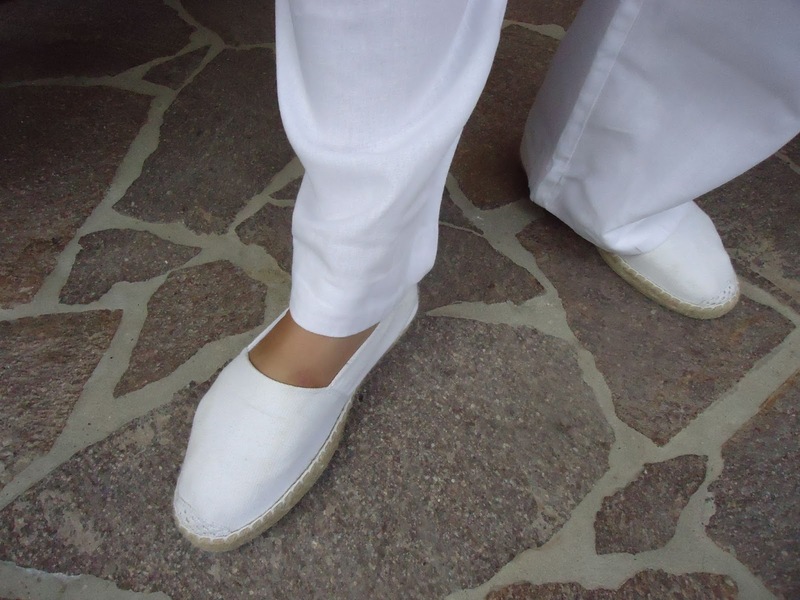 In the same way for men, I have seen canvas loafers called espadrilles but essentially they are not espadrilles. The traditional loafer upper is quite different. Several sources have identified Spain as the originating country but I was introduced to them in the Basque area of France, which of course adjoins the Basque area of Spain. And Basque is Basque with its own language irrespective of the national boundaries. Here espadrilles are a summer basic and there is no thought of "tendance" or trend. When I visit Arcachon, a seaside resort, I always buy myself a pair or two. Against my better judgement this year's purchase was a white pair. In Arcachon or anywhere in the South-West, it is not a matter of in-fashion or out-of-fashion. In the same way as we in North America buy those cheap rubbery flip flops, the espadrille is a summer footwear option in Spain and France. Of course you can pay $5.00 for them or $500.00. These particular ones were made in France and cost me 18 Euro, about $24.25 Canadian; $25.05 Australian; $23.06 American and 15.48 British Pound Sterling. NICE: Espadrilles are not so much a fashion item but a summer basic. Wearing an inexpensive pair, gives you the laissez-faire attitude required for hot summer days. Last week I was visiting in the south-east of France and saw a great pair of red espadrilles on a young woman. They were perfect for her foot, the heel fit well and did not look at all sloppy. In fact she looked rather polished and cool on a 40ish day in the Rhone. NO THANKS: Many have abandoned wearing them because "they keep falling off my feet!" Bien sur. However this NO THANKS can become an UN-NECESSARY. And of course the more expensive ones fit the heel better than the ones in the grocery store bins. Espadrilles with "squashed heel". Photo by JoyD, France, 2013. NECESSARY Evolution: The heel slips down off your foot, becomes smashed down, you continue walking on them, and essentially you now have a pair of quazi-flip-flops. In fact I like this look. Perhaps it further suggests the lay-back atmosphere of summer: "I can't be bothered to put on my shoes properly so I just slip into them and this is how it is." I have seen traditional ones, made in Spain and France, with laces or "ribbons" attached to the back of the heel so that you can wrap the ties around your ankles to keep the back from slipping down. 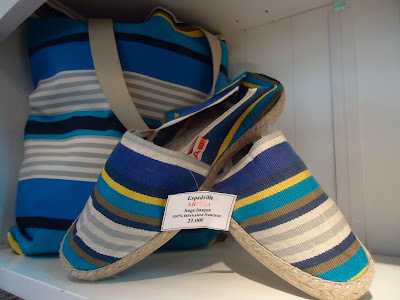 Striped Espadrilles in St. Emilion. Photo by JoyD. All my guests want to visit St. Emilion when they are here. There is a shop where linens are sold that has become my favourite and I always stop by with my visitors and we often browse and buy while our partners go off buying wine. Not only does this shop have linens for the table, but also peignoir and espadrilles. How convenient and how perfect are these striped ones for €21. Visit Soludos for contemporary innovations of the espadrille. One sales associate suggested to buy them really tight and they will loosen and mold around your foot. I received that information after buying a pair that was actually a size bigger than what I usually wear. I'll try that with the next pair I buy. If they stretch out and are too big, someone online (I forgot to take the address down) advised to soak the top cotton upper in hot water - don't immerse the jute soles. I can't imagine doing this. You would have to hold them in that position for five minutes . . . hmm, I think I'll just wear them as "smashed down heel flip flops". I'm speculating that if the jute is secured with glue, it will come apart if they are submerged in water. I suppose it depends where they were made. The more traditionally made ones should stand up to a 5 minute soak. I don't think I am willing to take that chance.